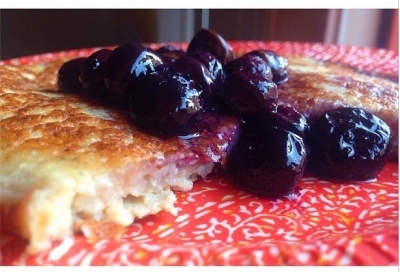 *Fluffy Blueberry Pancakes* My breakfast today can be your breakfast tomorrow! This is SO good it almost feels like I'm being naughty. 1. Blend all the ingredients on high for 3 minutes. 2. In a pan, heat up 1 tsp coconut oil on low-medium heat and pour in 1/2 the batter. When it starts to bubble up, flip! Repeat with the rest of the batter. 3.In the same pan, heat up 1/2 cup frozen blue berries and 1/2 tsp coconut oil. Cook until berries are nice and squishy. Top your pancakes!